One of the best things about fly fishing is the fact that you never really stop learning. You realize something new almost every time you go out. No matter how long you happen to have been doing it, there’s always a new fishery, style or technique to explore. The internet offers you tactics and tips daily on how you can make yourself a better angler. Of course, when most say ‘better’ angler what they really mean is how you can basically catch more fish. But hey, getting better means catching more fish, right? Anyway, this type of angling can have quite a steep learning curve for both adults as well as kids. For instance, on one hand, the motions used for casting are very similar to other types of angling, however, on the other hand, this type of fishing can prove hard to master due to the unique strategies and different lures involved. If you’re looking for how you can become a better fly fisher then you’re just in the right place. Here are a few tips on how you can improve your fly fishing skills. Being an expert fly fisher isn’t all about catching fish. There’s actually a lot more to it than that. The reality is that if the art of fly angling is something you’re going to master then the ability to ensnare fish isn’t the only thing you’re going to rely on. Your tying flies craftsmanship will also play a very big part in all of it. Yes, you can purchase pre-tied flies if you want, which might be the best options for the kids, however, there’s something special about catching fish using a fly you tied by yourself. Teaching yourself how to tie very many flies can also help one understand which flies to use for which particular fish and which type of scenario. Learning all this on your own can be hard and that’s why resources the likes of Fly Fisher Pro are here to help. In such scenarios where the water is small, always try to work upstream. This gives you an advantage when it comes to trout because you’ll be approaching your target from the rear. Some people take very serious stealth measures, such as crawling on the knees and hands up each pool, however, if you take a crouch stance, ensure your shadow stays off the water and avoid jerky movements then you should be just fine. You can help your child get into these positions. Because you are operating upstream, you can clearly see the series of runs and pools ahead of you. 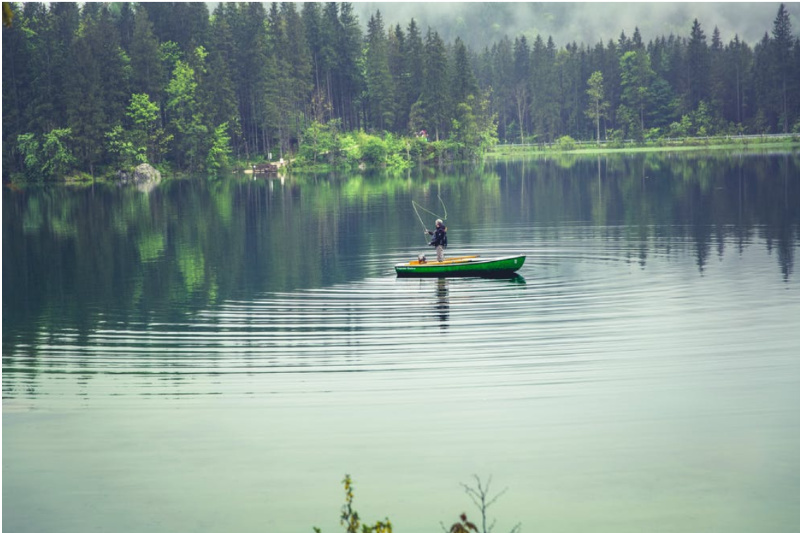 Planning an upstream course is putting yourself in the perfect position to cast your line while avoiding the throwing of your shadow on to the water. Arguably one of the best ways you can help make yourself and your kid better at fly fishing is by teaching someone else how to do it. This not only applies to fly angling but to just about anything in life really. When you teach someone else, you’re forced to look at everything differently from what you may be used to yourself. The fact that people understand things differently means that a teacher will most likely end up having to try five or six angles if they want to effectively communicate their points across to their student. The different communicative strategies involved can help one form a deeper and more comprehensive knowledge and understanding of the art of fly fishing in general. Just like with several other types of fishing and hunting, fly angling is an art form that’s all about resilience and patience. You and your child both need to learn the ability to sit still in one spot, trying out several different strategies knowing you may catch something or you may not. It can actually be mind-numbing for those that lack the mental fortitude, and that’s many children, unfortunately, to handle such situations. You need to always keep in mind that every time you do a fly change, not only are you spooking the fish you’re chasing but you’re also reducing the time the fly is in the water enticing the fish. An angler that has got the ability to stay strong as well as learn from their mistakes is the one that’ll eventually find success. Showing up prepared is not all about having the right equipment, which in this case is the flies. It is being prepared for any and every scenario that you think might come your way. Carry an emergency kit with you in your drift boat or truck, ensure you have some water and a few snacks which will help you get through the day without having to starve yourself as well as keep a pair of backup pliers on the ready in the event you lose the first pair. There a lot of things it takes to get fully prepared. The things we’ve mentioned here are just but a few of them. Different varieties of flies happen to be rendered more disparate because almost all of them can be found in a wide range of different sizes. Your favorite flies should always be available to you in different sizes, just in case. Try having them on hand at all times whenever you go out to fly fish, whether by yourself or with a student. For those of you that don’t find this possible, consider the fish you’re looking to catch and then carry out some research on the size of fly that’ll prove most effective at netting your desired fish. Having different sizes will help make you a more efficient fly angler. Fly fishing has a great community that surrounds it. Most people that are involved with this art of fishing are always so helpful to beginners and first-timers. They can end up helping you a lot when you’re first starting out, even when you have your kids and pets coming along. It will take some time before you can manage to catch even just one fish, but with enough passion, patience, and dedication you’ll eventually catch what you’re in search for. Hopefully, this article has shown you a couple of ways on how you can make fly fishing a reality in your life for you and your family.